Exploring the continued inequity and poverty caused by an unjust financial system. 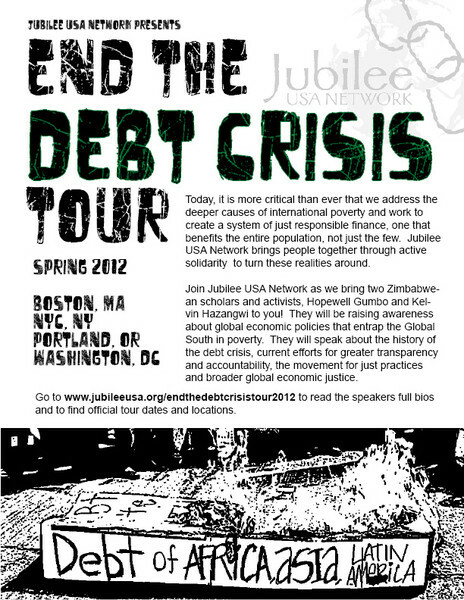 Join Jubilee USA Network on its End the Debt Crisis Tour as we take action and educate our communities about continued poverty and global inequity. As the debt crisis has moved from the developing world to the developed world, we must continue to forge stronger alliances with activists in the Global South. Our partners from ZIMCODD, an economic justice organization from Zimbabwe, will be coming to Oregon, Massachusetts, Washington D.C. and New York City. The tour will explore the current economic realities in Zimbabwe, how it relates to many nations in the Global South, and the global efforts to implement lasting social justice and transformation through debt cancellation and accountability in the international financial institutions. Interested in attending? Contact Alice Kidder at flintkiddr(at)aol.com. For more information, download the flyer for this event (473KB). Encuentro 5. Occupy Boston and Boston Housing Cooperative Group. 107 SE Washington St,. Music, Marketplace. An Easter Call: A Season of Jubilee for Low Income Countries? Hosted by St. Francis of Assisi Pax Christi group and co-sponsored by Maryknoll Office for Global Concerns, Jubilee USA, TASSC International, Archdiocese of Washington Global Trade Committee, Pax Christi Burtonsville and Pax Christi Metro DC-Baltimore. Eric LeCompte, Marie Dennis, Co-President of Pax Christi International will present along with our two partners from ZIMCODD! Already hosting an event? Download these promotional materials and outreach guide to make sure your event is a success. Need anything else? Please contact Jeremy. Hopewell is a leading human rights, social and Economic justice activist and political analyst. Currently, he is a Senior Program Officer with the Zimbabwe Coalition on Debt and Development, ZIMCODD. Prior to joining ZIMCODD secretariat, Hopewell was the chairperson of the ZIMCODD Southern Region and member of the National Board. He has a strong background in social activism from his time in college as a key leader of the Students Movement in Zimbabwe. He led the mid-90's students' campaigns against the privatization of education and the perpetuation of the Structural Adjustment Programs in Zimbabwe. At the moment he is a leading organizer of the Zimbabwe Social Forum. In the past year, Hopewell was arrested and imprisoned briefly in Harare Prisons for organizing a movie screening. Ultimately, "The decision to convict and sentence six activists to community service and a fine for organizing a video screening on events in North Africa last year is a setback for freedom of expression in Zimbabwe", Amnesty International said. Fortunately, through local and international solidarity, the sentencing was reduced -- at one point Hopewell faced ten years in prison. Hopewell is widely traveled in Africa and other parts of the world where he has presented at various conferences, seminars and forums on social and economic justice and human rights. Hopewell holds a Masters of Engineering Degree in Manufacturing Systems and Operations Management from the National University of Science and Technology in Zimbabwe. Hopewell also holds a Bachelor of Engineering Honors' Degree in Industrial and Manufacturing Engineering and is currently pursuing a Masters Degree in Development Studies with the University of KwaZulu-Natal, Centre for Civic Society focusing on the Role of Engineering in the Sustainable Development Discourse. Hopewell Gumbo will be speaking in DC and the Boston area. Kelvin Hazangwi is a leading human rights and social justice activist. Before joining the Zimbabwe Coalition on Debt and Development (ZIMCODD) Board as the Chairperson of the Northern Region Committee, Kelvin worked as its Senior Programmes Officer. Currently, Kelvin Hazangwi is the Executive Director of PADARE / ENKUNDLENI / Men's Forum on Gender. He has organized national campaigns on trade justice, anti-privatization and has participated actively in the national, regional and international social forum processes. He also participated and presented at the Annual United Nations Commission on the Status of Women and Girls at the UN headquarters in New York, USA. Currently, Kelvin also sits on the boards of the Members of National Anti-Domestic Violence Council, SAYWHAT, and Women and Land of Zimbabwe, a women's rights organization that advocate for women's access to control of productive resources. Kelvin is a past British Council Chevening Scholar who studied for an MA in Gender and Development Studies, at the Institute of Development Studies, University of Sussex, in the United Kingdom. He also holds a Bachelor of Science degree in Politics and Administration from the University of Zimbabwe and a Post Graduate Diploma in NGO Administration from University of Botswana. Kelvin Hazangwi will be speaking in DC and Portland.